Why Did Obama Use So Many Pens to Sign the Health Care Bill? After more than a year of bitter political debate and seemingly inescapable congressional deadlock, President Obama sat down in the White House East Room on March 23 and signed the 2010 Patient Protection and Affordable Care Act into law with a stroke of his pen. And then another pen. And another. 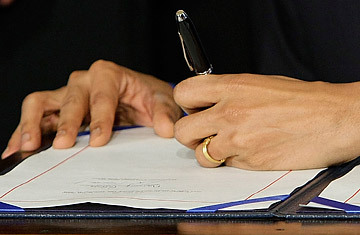 Obama used 22 pens to sign the landmark $938 billion health care bill. It would seem that either the President has an undiagnosed case of OCD or the White House needs better office supplies. Actually, the President was just adhering to an obscure Washington tradition. The practice of using multiple pens to sign important legislation dates at least as far back as Franklin Roosevelt and is now one of our government's frivolous little quirks, much like that oversize gavel Nancy Pelosi carried around the other day. The rationale is fairly simple. The pen used to sign historic legislation itself becomes a historical artifact. The more pens a President uses, the more thank-you gifts he can offer to those who helped create that piece of history. The White House often engraves the pens, which are then given as keepsakes to key proponents or supporters of the newly signed legislation. When Lyndon Johnson signed the Civil Rights Act in 1964, he reportedly used more than 75 pens (video footage can be found here, although camera cutaways make it hard to keep track) and gave one of the first ones to Martin Luther King Jr. Senators Hubert Humphrey and Everett McKinley Dirksen also received pens for their aid in shuttling the bill through Congress. And in 1996, President Clinton gave the four pens he used to sign the Line-Item Veto bill  which allowed Presidents to veto individual sections of legislation rather than the entire thing  to those most likely to appreciate the bill's impact: Gerald Ford, Jimmy Carter, Ronald Reagan and George H.W. Bush. But how does a President even sign his name with so many pens? Does he print it? Does his signature come out looking disconnected and wobbly? What if he runs out of letters? "I've been practicing signing my name slowly," President Obama joked in January 2009 when he signed the Lilly Ledbetter Fair Pay Act  for which he used seven pens. President Kennedy had the process figured out: when he needed more letters, he wasted ink by spelling out his middle name and adding a flourish under his signature. Once they're given away, some pens wind up in museums; others are displayed proudly in recipients' offices or homes. But they sometimes pop up again, like in the 2008 presidential campaign, when John McCain vowed to use the same pen given to him by President Reagan to cut pork from the federal budget. Not every President goes for the multipen signature, however. President George W. Bush preferred signing bills with only one pen and then offering several unused "gift" pens as souvenirs. Even a piece of legislation as famous as the Homeland Security Act got only one line of ink. When it was over, the President is rumored to have pocketed it. Read "Mourning the Death of Handwriting."